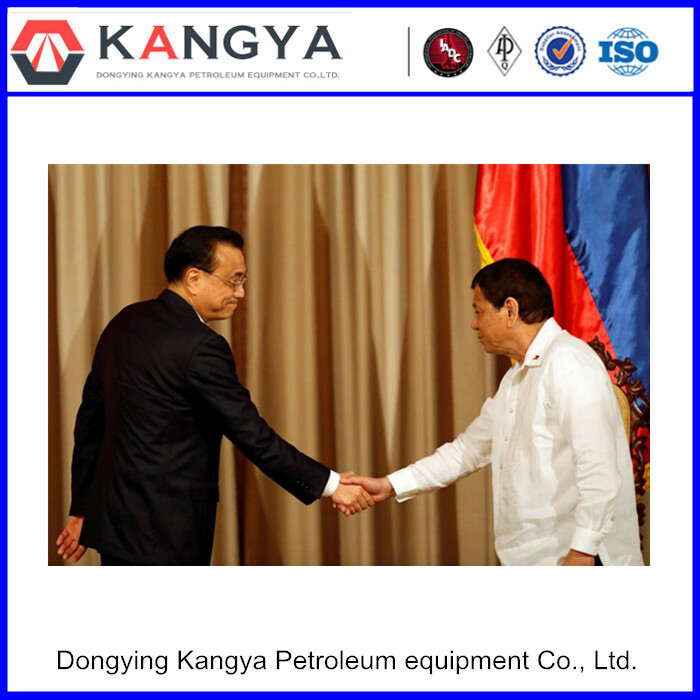 On the afternoon of November 15, local time, Chinese premier li keqiang, who is on an official visit to the Philippines, met with Philippine President rodrigo duterte.Li pointed out that there is a huge demand for infrastructure in the Philippines. China has accumulated rich experience and has mature equipment and technology. China and the Philippines enjoy win-win cooperation.On November 16 Philippine government issued a joint statement between the two countries, Japan and China agreed that all maritime disputes is not on the relations between China and the Philippines, to explore in the including offshore oil and gas exploration and development, and other maritime cooperation may carry out cooperation way;The two sides agreed to explore possible cooperation on ocean science.China is ready to expand imports of high-quality products from the Philippines to boost the size and quality of trade and investment. At present, the Philippines is facing economic and social development, improving people's livelihood and the reconstruction of Malawi, and there is a large demand for infrastructure construction, li said.China is willing to agree with the Philippine side the demand of the large-scale construction of infrastructure, giving full play to the advantages of China's equipment manufacturing and infrastructure construction experience, infrastructure construction capacity of cooperation and formulate mid-term and long-term programs. Li, said the Philippines will take over China ─ asean relation consultation, the Chinese side is ready to work together with the Philippine side, pushing China ─ the sustainable development of the relationship between the association of south-east Asian nations (asean) and injected lasting power for regional peace and stability.Duterte welcomes Chinese companies to invest in China and hopes to learn from China's development experience. The joint statement released on November 16 pointed out that the two countries have established a consultation mechanism on the south China sea issue to implement the consensus of President xi jinping and President duterte.The two sides agreed to strengthen cooperation in areas including Marine environmental protection and disaster reduction, including further discussions on possible cooperation in oceanographic examinations.The two sides believe that maritime disputes are not the whole of china-philippines relations.The two sides reiterated that maintain and promote regional peace and stability, sailing in the south China sea, and over the importance of freedom, trade and other peaceful purposes, including the UN charter and in 1982 the United Nations convention on the law, generally accepted principles of international law, not by force or threat of force, by direct talks on sovereign state through friendly consultations, to peacefully solve the territorial and jurisdictional disputes, commitment to self restraint in the south China sea, not to complicate the controversy, expanded and affecting the peace and stability. The statement noted that the overall situation of the south China sea is more stable with the joint efforts of China and asean countries, including the Philippines.The two sides are ready to explore ways of cooperation in the areas of maritime cooperation, including exploration and development of offshore oil and gas exploration and development.Relevant cooperation should comply with their respective domestic laws and regulations and including 1982 United Nations convention on the law, international law, will not affect the respective position on sovereignty, sovereign rights and jurisdiction.The two sides agreed to continue to actively promote the consultation and negotiation on the code of conduct in the south China sea (coc) and to ensure the full, effective and complete implementation of the declaration on the conduct of parties in the south China sea.